Fantastic cash back credit card for those who shop a lot. Anyone who spends less than $2,000 per month should look at other options. PNC’s CashBuilder credit card can be a great option for those who qualify for one of the elevated cash back rates. If you don’t have an account with PNC and if you spend less than $2,000 per month, you can do better with most other cards. How Does The PNC CashBuilder® Visa Credit Card Compare To Other Credit Cards? 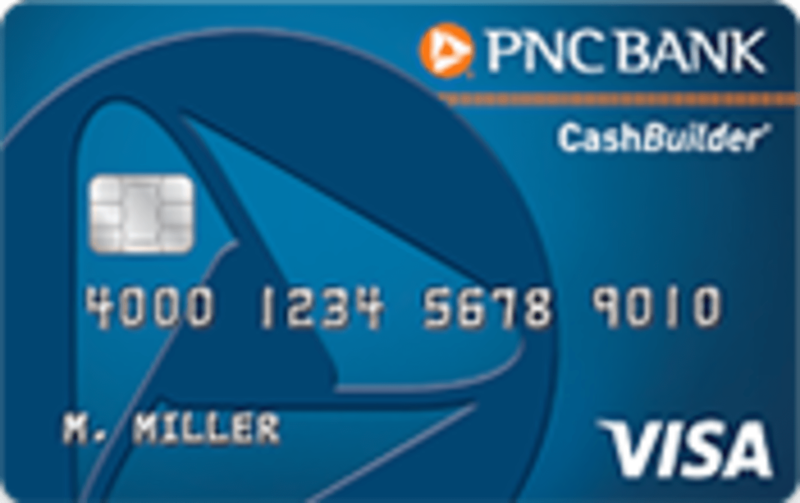 The PNC CashBuilder credit card has the potential to be one of the top cash back offers for the right person. On its own, the card has an unimpressive 1.25% cash back rate. However, if you spend above $2,000 per month or have enough money deposited in a PNC checking account, the card’s rewards quickly climb to over 1.5%. Those who can qualify for the elevated cash back rates may get more out of this card than some other long-term favorites, such as the Chase Freedom® or Barclays CashForward™ World Mastercard®. This credit card doesn’t come with a welcome bonus, which is its major downside. While cash back credit cards aren’t generally known for lucrative signup offers, they'll still put something on the table. The Blue Cash Preferred® Card from American Express, for example, gives people $150 if they manage to spend $1,000 on purchases within the first 3 months. The fact that the PNC CashBuilder credit card doesn’t offer anything of this sort makes it less attractive for individuals looking for big initial bumps. Bottom Line: The PNC CashBuilder credit card is great for people that meet the qualifications for either the 1.5% or 1.75% rewards rate. Outside of that, however, there's not much to it. The PNC CashBuilder credit card gives users fixed cash back on all spending. Cardholders will get a base rate of 1.25% when they first sign up. However, this can be raised to 1.5% or 1.75%, provided certain qualifications are met. Those who spend at least $2,000 within one billing cycle will get 1.5% back on their net purchases in the following month. That figure jumps up to 1.75% if you manage to spend $4,000 or more. Additionally, those who have qualifying checking accounts with PNC can also get the elevated cash back rates, as long as they meet certain requirements. The table below breaks down what your cash back rate for a given month will be, depending on your situation. How Does The PNC CashBuilder Credit Card Compare To Other Offers? It’s difficult to determine a credit card’s value in a vacuum. Therefore, we took a look at how the PNC CashBuilder credit card compares against some of the other cash back options. Anyone who doesn’t mind staying on top of things may get better value out of the Chase Freedom®. The card provides users with 5% cash back on up to $1,500 in combined purchases in bonus categories each quarter. Outside of this, the Chase Freedom® awards 1% back. The rotating categories go through a number of different merchants and stores, including gas stations, restaurants, select grocery stores, and wholesale clubs. Roughly 20% of your purchases need to fall into the above categories to beat a 1.75% cash back rate on the PNC CashBuilder credit card. To best a 1.5% rate you would need to have 13% of your spending be inside the bonus categories, and just 7% to beat the flat 1.25% rate. The Barclays CashForward™ World Mastercard® gives people a flat 1.5% cash back rate on all their purchases. Once you redeem your rewards, you get a 5% dividend towards the next time you use your rewards. That slightly boosts the ongoing rewards rate on the card to approximately 1.6%. Unless you qualify for the 1.75% rewards rate on the PNC CashBuilder credit card, there is no reason to prefer it over the Barclays CashForward™ World Mastercard®. The latter will give you the superior savings, and also comes with a welcome bonus. Overall, the value of the Barclays CashForward™ World Mastercard® is superior to the Barclays CashForward™ World Mastercard® on most fronts. Those who shop predominantly at supermarkets and gas stations should look at the Blue Cash Preferred® Card from American Express. The card awards 6% Cash Back at U.S. supermarkets up to $6,000 per year in (then 1%). You also get unlimited 3% cash back when you shop at U.S. gas stations. These rates are significantly higher than what you can get with the PNC card. Those who have more mixed spending, falling into other types of categories, should take a moment to consider which they would benefit more from. Our calculator below can help with that decision. The card does come with a $95 annual fee (See Rates & Fees). While that can put it at a disadvantage, it’s worth noting the high welcome bonus. Blue Cash Preferred® Card from American Express cardholders who spend at least $1,000 on purchases within the first 3 months will get $200 back. That’s enough to cover the annual fee for the first year, and half in the second. We built a tool to quickly estimate the value of credit cards. Input your monthly spending by category, and our calculate will approximate the rewards provided by the PNC CashBuilder and other credit cards.